Almond flavoring is one of the most beloved coffee flavors, but this Toasted Almond flavored coffee will make your taste buds want more and more with its freshly roasted, wholesome flavor. If you like your almonds to have a kick, this flavored coffee will wake you up in the morning or quench your almond-dessert cravings in the evening. 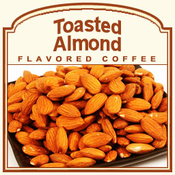 With only 2 calories, you can drink this Toasted Almond flavored coffee hot or cold, guilt-free � leaving room for you to savor the quality of our 100% Arabica gourmet beans. Roasted and shipped on the same day, this Toasted Almond flavored coffee will leave a truly nutty resonation on your taste buds. Packaged in a heat-sealed valve bag, you can expect the fresh-roasted flavoring of Toasted Almond coffee to tantalize your taste buds.